I sat on the couch next to my teenage son. Growing cold, I reached out and grabbed the blanket next to him. He looked at me as though I had purple spaghetti noodles coming out of my nose. He continued to stare at me with a bemused expression. That’s when it dawned on me. While I had plenty of attachment to the phone company’s catchy jingle from the 70s and 80s, my fourteen-year-old did not. It was just another example of classic Generation X references I use that he and his tween sister, 11, just don’t get. Teenagers today don’t understand a lot of what we think is hilarious. I pull out this phrase, made famous by Nancy Reagan, every time I talk to my kids about drugs. Hey, it worked in the 80s! Yes, I say this at the dinner table when I want someone to pass the mustard. No, my kids have no idea what I’m talking about, especially because we don’t have any Grey Poupon. Why be a boring mom who just says hello to her kids when I can be a cool mom who uses this Orkan greeting made famous by Robin Williams in Mork and Mindy? This Almond Joy/Mounds jingle is perfect for when you are snacking on nuts and offer some to your teens. That’s because you can sing it whether they want some or not. Teens love it when their moms sing. Sometimes when I’m walking down the street I break into this catchy phrase and start bobbing up and down just for fun. Laverne and Shirley would be proud, even if my kids are mortified. I whip out this Alka-Seltzer ditty whenever I pour a fizzy drink. It also works when I’m relaxing in the tub with a bath bomb. Mercifully, the kids are long past the stage of hanging out with me in the bathroom. Here’s to good friends. Tonight is kinda special. My husband and I crack ourselves up when we use this classic Lowenbrau line with a toast at the dinner table. The kids just tune us out. There is an emphasis on kindness in today’s schools. Yet, perhaps Generation X really started the kindness movement, as we were encouraged to be nice to our VHS cassettes. Just a thought. My kids are not twins. However, that does not prevent me from shouting this out when I want them to work together. They should just be thankful I didn’t name them Zan and Jayna after the original Wonder Twins. 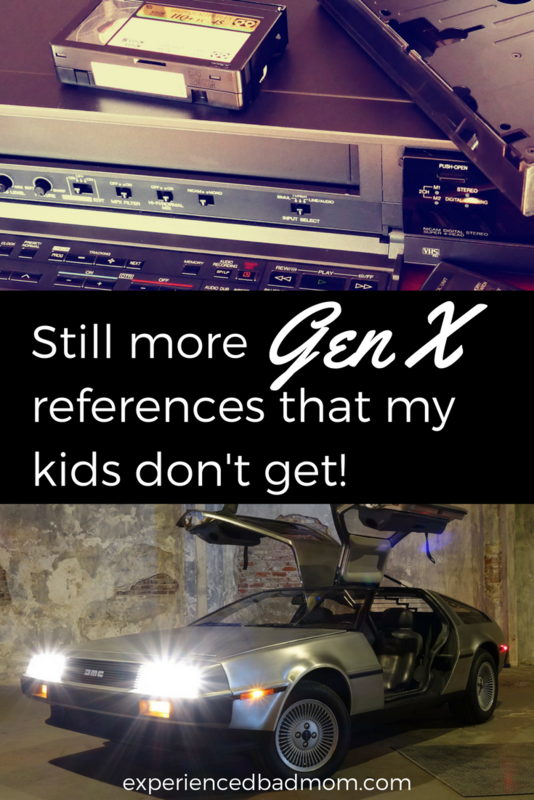 Even though my kids don’t get any of these Generation X references (or the others I’ve mentioned before! ), I don’t let that stop me from using them. Like, totally. Gag me with a spoon. This post originally appeared on Your Teen for Parents. This is so funny! My kids think I’m an old dinosaur. Be kind, rewind!!!!! Oh, they definitely don’t get that one! One of my favorites, “Danger Will Robinson!”, is so old that it’s new again. You are too young to remember the original Lost in Space but apparently, it is being brought back to life on Netflix. Will Robinson and his proclivity for getting into danger will soon be back in our lexicon. I do remember watching re-runs of Lost in Space! And the new incarnation on Netflix looks interesting. I did watch the original then watched the movie they made in the 90’s and I got super excited when I saw the previews of the new one on Netlfix. I tried so hard to get my boys to watch it with me but neither of them were interested. I’m not giving up though. Even though I’ve already watched the season I’ll watch it again just to get them to watch it lol. Ha Ha Ha so with you on this one! I too do silly things like this to my kids, who just roll their eyes and call me ‘weird’ they just don’t appreciate my sense of humour. I bit like everytime my teen daughter mentions her friend Sally, I can’t help but respond with ‘what Sally from the block’!!! Worse still, when I asked them if they would come see Rick Astley with me they were like ‘who the hell is he’.!!!! Lol. I’ll go with you to Rick Astley!!!! Mine *might* remember video cassettes. But if I pulled out my Bryan Adams cassettes they would look at them like it’s from outer space. Ha ha! Enjoy their blank stares. It’s so weird that we’re raising an entire generation of kids who don’t even KNOW what commercial jingles are!! Okay…I’ll admit that I didn’t recognize many of these…I try to reject the “Millennial” title but sometimes it sneaks up on. I was proud of myself, however, because I DO remember the “Be kind, rewind!” stickers on VHS tapes we rented from the “movie store” when I was a kid (my dad had a tape rewinding machine that looked like a silver car and made engine revving noises when it was rewinding a movie. Highly memorable for a young child, apparently). And I know about “Wonder Twin Powers, activate!” but that’s mostly because my mom is a twin and said it a lot whenever she was with her sister. That’s pretty fancy that your dad had an actual rewind machine–and a fun memory!